My dear friend Alexandra's apartment is featured on the Apartment Therapy blog today. Her apartment is STUNNING. You can see all of the photos and read about their design choices here. In 2010 I made a quilt for her daughter, which is hanging on the crib above. Alexandra is Creative Director for the online store Erie Drive. I knew she would not want a quilt with a fussy pattern, but she would like one with great colors. So I made a fun quilt, using a very simple pattern. No fabric was purchased for this project - it was all from my stash, which you can tell by the seam line in the bottom border! Surprisingly, I still have a photo of the quilt on my camera. Terrible photo, but a really fun, happy quilt. It's baby season again, and time for a little quilt for a new baby girl. I did not know she was a girl when I made the quilt, so it was fun to keep the quilt gender neutral. I started with one Moda charm pack, but what was I thinking, that is not enough fabric for a quilt. (Actually I know what I was thinking....I had my daughter and husband with me so I grabbed a pack that I liked so we could move along quickly, and I did not think about quantity). I added in some of my stash fabrics and I think the results are fun and cheery. Who doesn't love a zebra print on the back? The last of the 2011 babies in my life will arrive shortly. Her working title is Valerie. 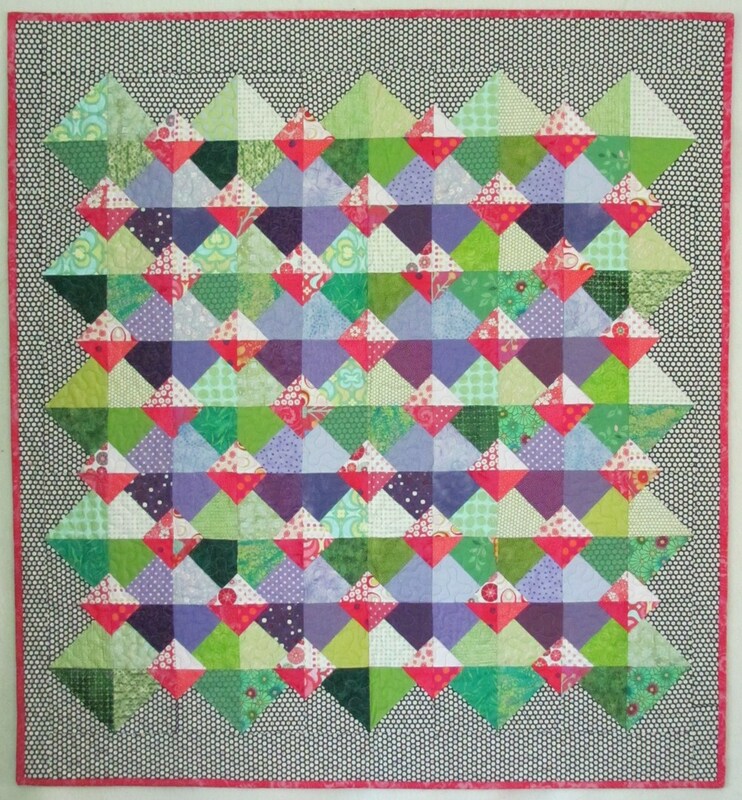 Valerie's quilt: Like the quilt for Max, I tested one of Linda Warren's patterns, "Pyramid Scheme". In this case, I think I did follow the pattern exactly as written. Shocking. I did have to add the crazy black and white border, otherwise it wouldn't quite feel like a quilt I made! If you would like to buy the pattern, you can get more information on Linda's website. My good friend Linda Warren is an amazing pattern designer. Her designs look very complicated, but are actually quite easy to construct. Using her enviable math skills Linda has designed a new ruler that makes piecing "circles" a breeze. And, they come out accurately. And, you don't tear your hair out while working on them. I was lucky enough to test the new ruler for her. I followed one of Linda's patterns (and made a few modifications, because following a pattern *exactly* as written goes against every fiber in my being), and made this little quilt, which I think turned out great. The quilt now belongs to a soon-to-be-born little boy. You can see the new ruler in action in October when Linda will be demonstrating it at A Notion to Quilt during the Massachusetts Quilt Shop Hop. Every month my Round Robin makes half-square triangles and passes them out to each member. That way each month we all get 12 different half-square triangles. In this quilt I took the accumulated squares and arranged them in a color sequence. And here is a sweet quilt for a soon-to-be-born baby girl.